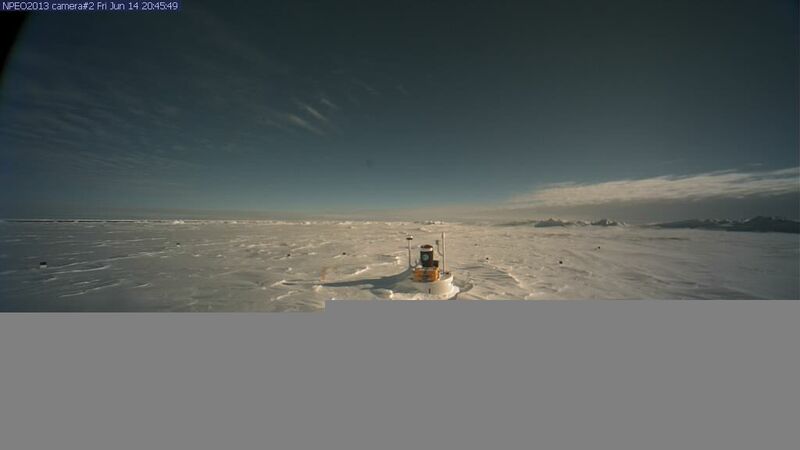 Last week, North Pole Camera 1 began to record visual images of cracks on the surface of sea ice. Now, just one week later, open water is visible in the same location. Meanwhile, cracks are beginning to show up in the vicinity of North Pole Camera 2. On the ice near these cameras, our Persistent Arctic Cyclone, which has continued to thin the Arctic’s Central ice since late May, is beginning to have a very visible effect. Though the storm center has moved away, leaving these areas mostly sunny, the agitated ocean beneath the ice is making its presence known through cracks and open stretches of water near both of these cameras. 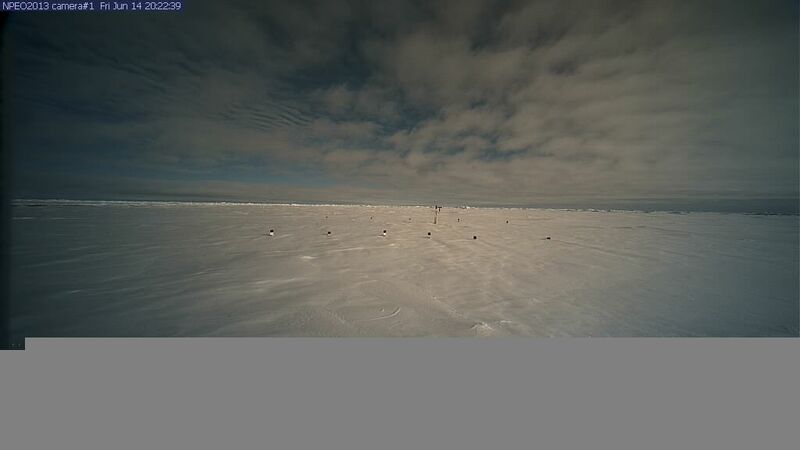 At North Pole Camera 1, to the right hand side of the most recent shot, open water is visible. The best way to see it is to look straight ahead at the anemometer, whose top establishes the horizon. Then, look to the right. There a growing wedge of blue-grey, indicating open water, appears. If you look closely at this section of the image, not only can you see open ocean, but breaking waves are also visible at the ice edge. (It works very well if you have a touch screen you can use to zoom in on this section of image). Once you locate the ice edge, follow it with your eyes. At this point, we can notice breaking waves from horizon to horizon within the frame of the picture. These features, though subtle, are plainly present. Given this opening of water near Camera 1, one wonders how much longer this camera will keep sending pictures to us. At North Pole Camera 2, a crack in the ice has now also developed. If you look to the left-hand side of this image, you can see a thin, black crack appearing in the distance. 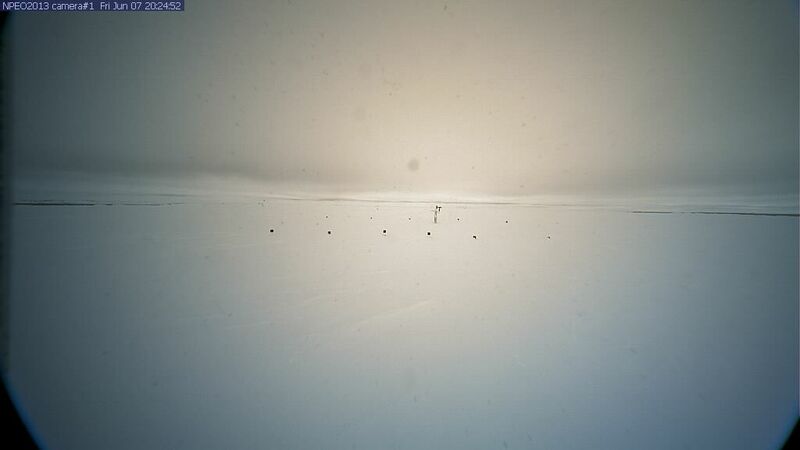 APL has managed cameras near the north pole for years. This is the first time we’ve been able to see cracks and sections of open water from cameras located so close the central sea ice. These images are being taken in early June. A clear sign that the central ice is far more fragile than usual for this time of year, much less any time during summer whatsoever. A large, rapidly expanding, series of ring-structure cracks in the Arctic sea ice that began in the Beaufort Sea in February has now expanded to encompass much of the remaining thick ice and to cross the North Pole. In the upper-center portion of the above image, you can see these crack structures pushing through the remaining thick ice and arcing up through the North Pole itself. 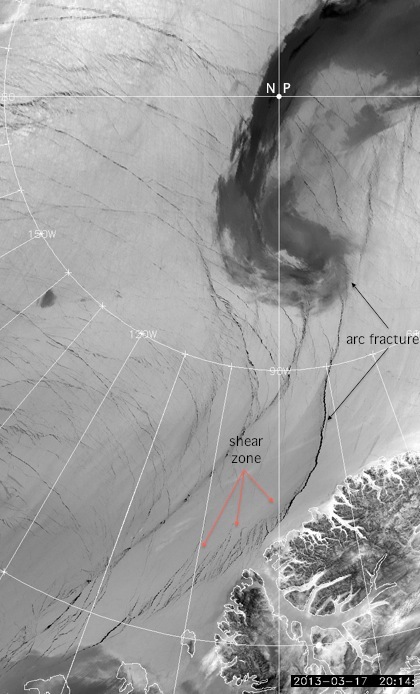 These North Pole vicinity cracks first appeared a couple of days ago. Since that time, they have rapidly expanded to cover much of the remaining thick ice. Note how, in the last few frames, the thick sea ice begins to crack as it lifts northward off Greenland and the Arctic Archipelago. As the latitudinal cracks break the ice, you can begin to see hair-line longitudinal cracks emerge. So we have an ever-expanding and ongoing crack-up of a large portion of Arctic sea ice. This increased cracking will, likely, make the ice sheet in cracked regions far less resilient to melt once more direct sunlight begins to rain down starting in May and June. Other areas worth continued observation include two expanding areas of thin ice north of Alaska and Western Canada. A good number of amateur and professional eyes are currently keeping tabs on the crack-up, so we will continue to post updates as they become available. The above series of images is a composite of ASCAT radar sequences for 2010 to 2013. They were produced by anonymous Arctic Ice Blog comment poster A-Team. A-Team has recently gotten the attention of Climate Central and Discover News, among others, for his/her vivid images tracking an unprecedented sea ice break up starting in February of 2013. This, most recent, series of images composed by A-Team compares this season’s Arctic sea ice with that of 2010 through 2012. These radar images both show cracks and the motion of sea ice. As can plainly be seen, sea ice motion and cracking is far greater for 2013. Unprecedented cracking and rapid motion of late winter sea ice is yet one more sign of sea ice fragility. Though it is no guarantee that sea ice melt at end of summer 2013 will produce a new record low, as happened in 2012, it does appear to be yet one more factor emerging from an ongoing period of catastrophic melt that began in the 1950s and has accelerated since 1979. It is worth noting that, if the current rate of sea ice volume losses holds, there is risk of a complete Arctic melt as soon as 2013-2017. Learn more on Neven’s Arctic Ice Blog. Ever since early February, a growing section of the Beaufort sea ice has been breaking into a large system of expanding cracks. Now, it appears that a very large crack has run down the back of the Arctic Archipelago and the north shore of Greenland, lifting much of the remaining thick sea ice off its anchor there. 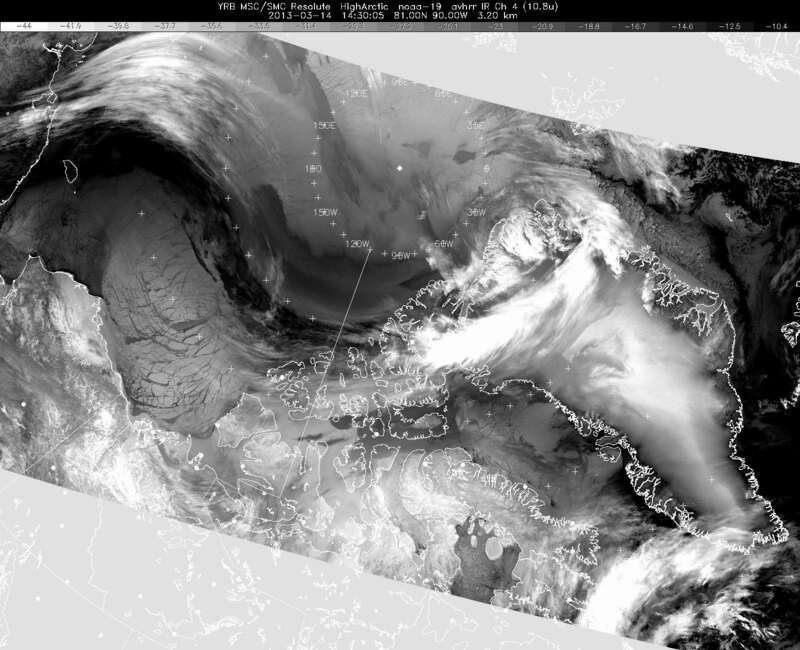 You can view this event by watching the last few frames of the US Navy sea ice animation above. These animations have a rather low resolution. So the fact that this large crack has become visible in this image is a testament to its possible size. 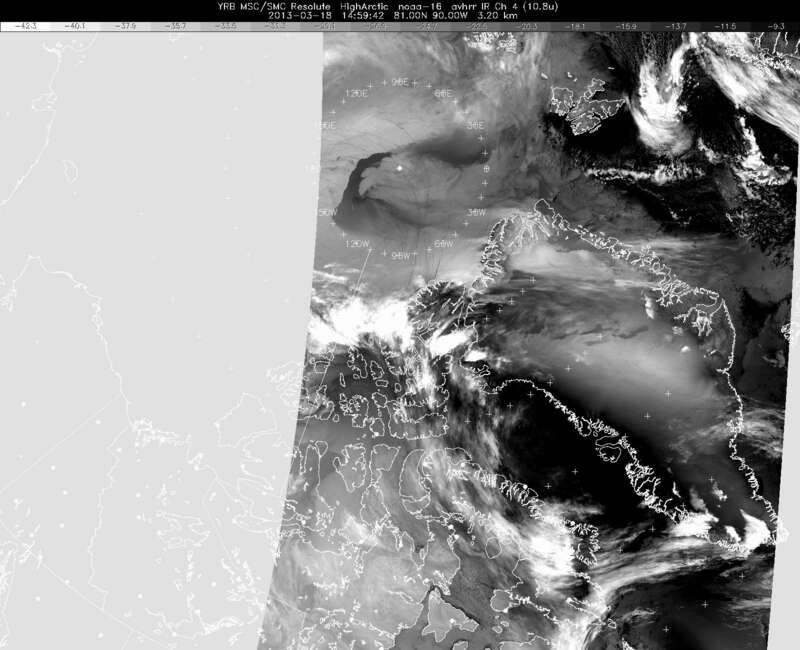 Clouds appear to have obscured much of this region in the satellite picture. So we don’t yet have direct observations of this cracking event. Such a direct observation would provide confirmation that the crack is as large as it appears in the US Navy composite. We’ll have to see if the US Navy data bears out in the satellite picture. However, it appears that the current crack-up which may pose serious risks to Arctic sea ice come late spring and summer, continues apace. Much of the Beaufort sea is riddled with very large cracks and broken sections of ice. Crack systems appear to have spread further north and east, creating the overall impression of an ongoing break-up.